Born in New York in 1824, Allen B Wilson patented his design for a rotary-hook-and-bobbin sewing machine in 1850. He co-founded the Wheeler & Wilson Company the following year. Then, in 1854, he patented a machine with a four-motion feed for moving the material on after every stitch. These machines were very popular and Wilson continued to receive royalties from these patents for the rest of his life. 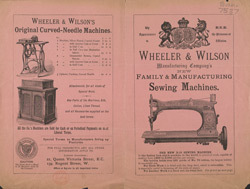 Wheeler and Wilson's sewing machines were the most widely copied model of their era, and they were one of the Singer Company's main competitors. Singer eventually bought them out in 1905.